Meet Sum Yung Guys and see why the town is abuzz with how this Sunshine Beach restaurant packs in the patrons. It’s easy to see why: the food is amazing and affordable and the breezy Duke Street location overlooking Sunshine Beach is ideal. Since swinging open the doors 6 weeks ago, the patronage from visitors and locals alike has been solid. But dig a little deeper and there’s more to this place than superb food – Sum Yung Guys are definitely greater than the sum of their parts. Four local guys got together in December last year to collaborate on a shared creative vision for the restaurant. According to Dylan Campbell, co-owner and restaurant manager, the plan from the outset was to NOT play it safe. “We definitely do not want to be your typical Noosa restaurant, catering for one particular main stream market,” says Dylan. “We cater for all ages. While some clients love the music and cocktail scene, others head straight to the courtyard for a quiet retreat that could be anywhere in the world,” he said. 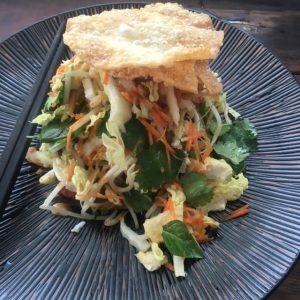 With signature dishes including Mandarin cured swordfish, Gangnam style beef tar tar, sweet and sour pork and confit duck curry, the restaurant aims to serve the best Asian inspired cuisine in Noosa. All four of the owners are huge fans of Asian cuisine and this comes across in the classic Asian flavours on offer. “The taste is true to traditional Asian styles, rather than an Asian fusion,” says Dylan. “We love showing people classic Asian flavours, but with local ingredients to give an edge,” he says. A passion for everything Asian is everywhere from the décor to the drinks. One of the owners, Matt Sinclair was well-known on Master Chef for his prominent Asian flavours, while Dylan’s work in a Chinese medicinal cocktail bar inspired the drinks menu. “We love all the strong bold flavours and the sweet and the sour of Asian cuisine – the challenge is balancing all of those things,” says Dylan. 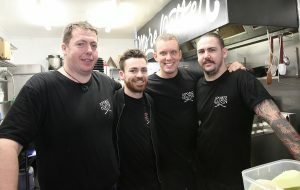 The open kitchen is the hub of the operation and the three chefs, Mo Rickard, Jerimiah Jones and Mat Sinclair are all co-owners, along with Dylan Campbell. The team all met 8 years ago while working at Noosa’s Bistro C. After several years of heading in different directions, they reconvened to found the Sum Yung Guys venture. With 4 sets of eyes to keep an eye on things and to manage the whole restaurant, there has been a constant process of refinement to make service as good as it can be. While affordability is a priority, use of local produce and support for local suppliers is also an integral part of the Sum Yung Guys ethos. “We go out of our way to find local farmers and producers to supply us with their products,” says Dylan. “It’s really important to us that we are supporting the local community as much as we can. “We want to be a restaurant for locals where visitors to Noosa also love to go. “If a visitor comes to Noosa and if a local says you can’t leave Noosa without trying Sum Yung Guys, then our job is done,” he says. 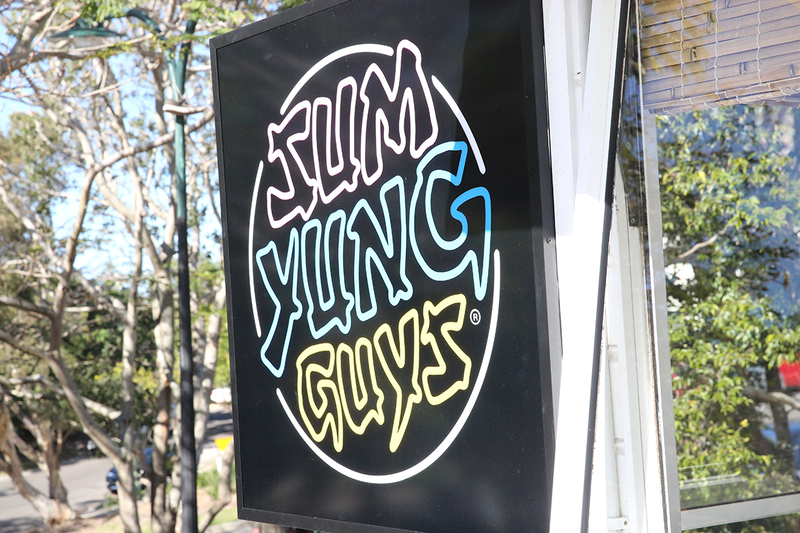 Sum Yung Guys is indeed fast becoming a must-do Noosa experience. The restaurant is situated at 46 Duke Street, Sunshine Beach and is open for lunch and dinner 7 days a week.